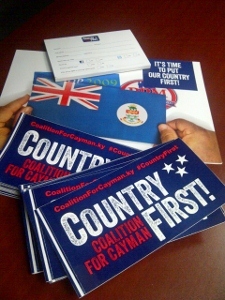 (CNS): A telephone straw poll commissioned by the Coalition for Cayman of 242 registered voters across Cayman asking which candidates they will be more likely to vote for indicated that the C4C was the most popular team in this election. C4C said that, according to the results of the poll by Cherry Communications, a political survey and market research operation in Florida, only 18% of the voters who answered the question said they would vote for a UDP candidate, while 33% said they would vote PPM and a whopping 49% said they would vote for a candidate endorsed by C4C. However, the leader of the opposition said the group was “grasping at straws” with the survey. The poll was conducted between 25 February and 2 March, with answer categories rotated in order to assure objective results, C4C officials told CNS. The results are based on 242 completed surveys from a random pool of registered voters in the Cayman Islands. C4C said those who took part were asked if they would be more likely to support candidates from the United Democratic Party, People’s Progressive Movement or independent candidates endorsed by Coalition for Cayman. With almost half of those surveyed saying they would vote for a C4C candidate, officials from the coalition said its people hold a sizeable lead over the two parties. It is not clear whether the voters were asked about other independents not endorsed by C4C. The C4C claimed that its endorsement would make a difference because they will only endorse those who will put country first, a mantra adopted by the group, which still gives little away about the policy position of the C4C members if they are elected to office. In addition, it is not clear which candidates were mentioned in the survey, since at the time it was conducted, only Roy McTaggart and Winston Connolly had been formally endorsed by C4C. Jackee Haynes was also endorsed but not until after the survey. He also pointed out that the C4C cannot form a government with only seven candidates. “With18 seats in the Legislative Assembly, a government can only be formed by a group or team comprising at least 10 members. To date, C4C has only supported seven candidates — five in George Town and two in West Bay. How then does C4C explain how they will form a government with so few candidates running for office?” he asked. At present, only three candidates have been endorsed by the group. Sharon Roulstone and Jude Scott, a founder of the organisation, both of whom are running in George Town, said they are seeking endorsement. Indications were also given by the two West Bay candidates, Mervin Smith and Tara Rivers, who were on the C4C platform when it launched in November last year, that they too want C4C support. In the meantime, late Sunday evening Gregg Anderson, one of the leaders for the Coalition to Keep Bodden Town Dump Free, declared his intention to run for office in that district and to seek support from C4C. However, even if all of those who are expecting to get coalition support are returned on 23 May, the C4C would still only have eight seats and would need two more MLAs to form a government. Alden McLaughlin said the Progressives has a team of 14 candidates in 4 districts who are all well versed in what matters to Caymanians, residents and investors. “We have seen the failures of the last four years and will work to bring good jobs back to Cayman, build our economy, root out corruption, restore confidence in government and make us all proud of the country we live in,” he said. This is the first poll conducted by a political group where the results have been released publicly. While both of the political parties are also understood to have conducted various telephone surveys over the last few months in relation to their own positions, neither has released the details. Pre-election polls are a massive feature of other democratic elections but they are still in their infancy in Cayman, with sources saying that people are very reluctant to take part, which means sample numbers are often too small to give a truly reflective preview of the way the electorate is swinging. C4C cries down the paries for this but aren’t they asking us to vote straight.?!? Why is it okayto vote straight for c4c but not up or ppm? I don't think it's just C4C. Our household (and friends in similar situation) added some voters to the roster this past year and we all had a half dozen calls, all around dinner time to our home number and various cell phones (some of which were not listed numbers in the directory). When questioned the cagey caller identified themselves as a TEXAS-based survey company, and then asked, not for the leader of household, but for the youngest (and most impressionable) voters in the household. This was patently bizarre and we ended the calls there. They continued to call for some time, even after we asked to be put on their "do not call list". To us, it reeked of a political youth rally. So there must be other groups angling for some votes using foreign intermediaries. C4C said their survey was done from a Florida based company. The Texas company must be someone else. That's what they were saying…"not just C4C". West Bay: McKeeva Bush, Rolston Anglin, Dwene Ebanks, Tara Rivers >> McKeeva because thats an obvious, Rolston because people like him, Dwene because he is a genuine good man and Tara because she is a strong woman that can speak up for the domestic issues of West Bay. George Town: Kurt Tibbetts, Roy McTaggart, Winston Connolly, Matthew Leslie, Mike Adam and one of the 3 women will get in as I think GT must have a female candidate but all 3 I like. >> Kurt just a natural shoe in, Roy this guy I think has alot to offer in fixing our finances, Winston because he will inspire alot of young people who want to have a part of the corporate ladder, Matthew because this guy has been hitting key social issues and word onnthe street is he is that undeciding vote that people will give and one of the ladies as GT like WB will need a female to be the voice for the GT women, single moms and the domestic factor. Bodden Town: Anthony Eden, Osbourne Bodden, Mark Scotland and Wayne Panton>>> Anthony because thats obviously a family affair, Osbourne because he can show he is not afraid to take a cow cod to any issue amd he really does care for people, Mark because whether you like him or not he does alot to help people and has a strong following and Wayne because the other candidates so far to choose from dont impress me. East End: Arden McLean >> do not know why John McLean Jr is even trying after that $200,000 slush fund money MxKeeva gave him. Brac and Little: Julliana and Moses K. >>> its a good balance with these 2 til someone takes on Julie and beat her in this race. I think your GT meter is WAY off! For GT I say Kurt, Alden, Winston, Joey Hew, Sharon or Marco…the last one is a toss up but Mike may scrape by on his nice personality. Matthew won’t get votes from any women who know him so that’s a whole half of potential votes down the drain for him…past and current behaviour matters and his will bite him in his *ss. Roy doesn’t know a large chunk of the GT electorate and what’s more, they don’t know him. Winston has the same problem, but he has a much better chance at overcoming it. Mike’s reputation as a nice guy has taken a hit because he has stuck with McKeeva – shows he is cut from the same cloth despit his different personality. Would you please go back to your drawing board. But before that get the voters list cause that will help you. Please see all those new Caymanian Status holders, well they are Mikes voters plus the George Town whites. Mike is a good man and everyone loves him. Good going Mike, you will be a winner. Matthew Leslie?????? Are you kidding me? The man is in court on various Pensions, Labour and Imigration issues. We don’t need anymore candidates who have to attend court every 2-3 months for their legal woes. When the counts are all over….the next Government will be a coalition one. Apparently you haven't heard that McKeeva could be attending to more pressing matters come May? Just becauseyou have 4 votes, doesn't mean you need to use them all. So far, we're planning to spoil at least 3 of them in West Bay. Every single one of them that we do vote in always makes broken promises to the people. My plans for this election will be "YES I WILL VOTE FOR YOU & YOU" so I can get some money out of everyone of them and then vote for NO-ONE! Then i will take my money and go buy me some nice fry fish and dumplings and lay back in the shade drinking sweet white rum on election day! We honestly don't need a party system…. They would be the most popular team according to survey as it probably called most of the founders of C$C and its extension cord supporters. What a joke survey, wouldn't be my vote they getting!!! Do anyone know what telephone number these pollsters were calling from??? Florida. I took the poll and answered honestly. Don't believe your party politics trolls. The people are tired of career politicians and the two-party system. It has historically ruined other Caribbean islands so I pray our peole wake up from this nightmare and see the two-party system for what it is…. a way for a small group to bounce power back-and-forth while the people get pooer. Tell me….Proof? Has the country been better off with frugal spending since the party sytstem started? No, the party system has bled us dry and blamed each other the outside world. We make enough to be a sound financial country…only the waste has put us into debt. Stop the madness. Voite for men and woman not a party line. Texas calls from another survey firm – wanted to speak with our teens. What I found strange about the survey was that they could not identify themselves, who they represented and how they got my telephone details. Now we know who was behind the survey and surprise it was the Big Money C4C. What happened to the transparency? I would like to know how they got my contact details? Once again MONEY makes cayman go round. Sad…..because nothing will change if they gets in! They were behind UDP believed in their principles and financed their platform, so I don’t expect anything to change. Was this the "poll" that called me and wouldn't identify themselves nor who was paying for the poll and asked to speak to the 'youngest registered voter in the household'? I told them truthfully that I was the youngest, and I'm in my 50's. They responded by hanging up. I wasn't terribly impressed with them if that was the same group. I would've probably disconnected anyway if they remained unwilling to state who was funding the poll. I realise the person was just doing a job, and it was not my intention to make their job difficult. Here's a hint for future pollers: If you are not allowed to disclose who is funding you, I'm not willing to talk with you. I just want to know, and believe that I have a right to know. Did they perchance get your name from the voters roll, and your number from the phone book? My wife received calls to an unlisted local cell number, as well as our household main line. I heard Johana Moxam on the tv saying that all C4C was doing was administrative and research papers for candidates. What a very misleading statement – i see now that c4c are doing polling too. I find this hard to believe because, according to my poll, I am leading in all districts. Something is definitely wrong because according to McKeeva's poll the UDP has 81 percent of wotes island wide. Obviously he was reading the results upside down again. The only one I will be voting for is independents across the board no parties. I want democracy. When they have a party its like they are a mafia. They solve only their constituents problems. Like Joey, barkers beach patrol etc. The other group made us broke with 100 million dollar schools. For whom? Not us, not our families. Had we not built so many schools we wouldn't be broke. What about all those status grants? Did you all forget? Who did that benefit? That my dear folks is party politics. What about the seamen and vets? A lousy $500 per month. Not much to you but a lot for old people trying to live a decent life. $560,000 for rangers ? What are they hunting, turtles? What about the Dump? Did Mark call a meeting to say we thinking about it? Did he not say its going to happen whether you like it or not?? I don't need that kind of party politics. I want to be able to talk to my representative and they try to solve my or my families problem. I don't want to go to dept of social services and get a handout by begging. Come on people think isn't Ezzard a independent ? Then should all of them be independent ? That actually sounds like a good thing for most people. But he dosen't do hand outs so many of Caymans voters will be complaining. Not a statistically significant poll at all. 243 voters out of 16000, that is only1.5% of voters. They called me FOUR times. I imagine some people answered more than once. They called me twice. I told them that they had just called me the night before. I don't know why they calling Brac as they aren't fielding candidates here. while our middle class dissapear and the Islands go further into financial diseray, no debate or democract in parlement just shouting at each other across the isle. No one polled me but just to be clear I will be voting PPM straight in George Town. I will be endorsing PPM ( Progressives ) as my 4 candidates in the Dristrict of Bodden Town as I know they will run things at an improved standart for we . Fist however we need to discuss the Dump in B.T and the closing of West Bay Road to know where you all stand ’cause that would seal the deal (votes I mean). Crongratulation to all Independants because there are some good. But I worry for some of you because to play you will have to be ruled by the C4C committee or some type of advising group of individuals . I am quite confused as to the C4C and it’s LONG TERM Agenda. really must say that I prefer a True Independant that sticks to its guns all the way. And will we be desapointed later again when a different color appears out of nowhere ? Please No more UDP or UDPier (same bag ) for the future election. Can’t change the Mold. We would all give at least 1 red cent never to hear Foolio,Big Mag and the list growing fast. Finally the usual double edge sword types are also running and we know what their about already so sorry Bobbo’s we have some serious work to do and can’t waste it on you guys. Whatever you do Please Vote and remember the “Observers ” are here so unna behave, you hear ! None of the PPM Bodden Town candidates support moving the dump to BT. You know what, I am really tired of hearing that the C4C candidates are forgoing well paid jobs in order to run for public office. Lets be real, all of us now or in the recent past has/had a well paying job. All that the C4C candidate has done is to take a business risk that the economy will be depressed for a further four years and have decided to go for the guaranteed $100k+ salary to cover that risk. It’s the smart thing to do but don’t for a minute think that the rest of us are fools and have not recognized that this is your MAJOR motivating factor in running. Agreed. If the economy was booming, it would be interesting to see how many of the C4C candidates would have abandoned the private sector for the lowing paying public office. If you think half these C4C candidates have an income as low as $100K, you need your head examined. $100K is small change for some of these people. And if you think the former Premier and his team did it for the salary, same issue. The difference is that some will benefit, along with the rest of us, from a general improvement in the economy, whilst others benefit more directly and selfishly from ensuring that tax payers money and Cayman's land and concessions are contributed in ways that benefit their interests rather than the general well being. MLA benefits exceed $500k/yr for many. Is C4C now a political party? Obviously c4C goes well beyond what a PAC does. It is endorsing a team of candidates who, according to Roy McTaggart, have a unified vision and he believes can form the next govt. It is tearing down anyone who belongs to a party, particularly the PPM and is activiely financially supporting and campaigning for its candidates. It has declared that it will not endorse a party candidate regardless of their views, integrity etc. That's not what a PAC does or how it behaves. It is not normal for PAC to have most of its founding members stand as candidates. "a group of persons who have united to contest an election". C4C certainly fulfils that definition but will choose not to be registered as a political party which it is in all but name. Whether its a party or not – I like that they are committed to a very different style of 'party' – and the high calibre of thier candidates – in all areas – inteligence, success, integrity. I think however one major issue is the non-candidates on the C4C committee who all of us – even the supporters of C4C are very unsure or uncomfortable about. They are unknown to the community (mostly) and stay in the shadows – and thier motives and values are unclear. Well if they ARE a party, I'd like for them to just come out and say it. If they can't be truthful about that, can't imagine they're getting off on the right foot. Might be the traditional foot though, however. Absolute chicanery. C$4C learn your lessons well, you doint stand a chance this election. MERCHANTS NA GWAN RULE THIS COUNTRY AGAIN. power to the people! The definition of a party in the Elections Law is "group of people running together". Why are they issuing press releases together if they are not a party? Chris Saunders is going around Bodden Town telling people that he has the c$c support in the district. Maybe thats why UDP are only running 3, they leaving a seat for Vangard. C4C = UDP but my vote going straight PPM…. C4C will not endorse Chris Saunders in BT or any UDP candidate. Will you endorse ppm candidates ? That would be too obvious. Better to split up now and regroup later. Only big UDP financial backers who have decided to be candidates. LOL, as if they would announce any other conclusion. Just shows how much money they have to spend. Don't be fooled by this voters, please. Only people who vote straight line for parties are fooled. ha ha. Sorry, PPM and UDP your time was wasted. If you look at C4C they are intelligent and can take away the Board bias, crooked counting, and crony corruption. Bye bye UDP & PPM…you only fooled us for a decade or so. But the PPM appoint many persons to boards not based on party affililiation. With the UDP you absolutely have to be in bed with them. Intelligence does not necessarily mean freedom from corruption. I can think of at least one candidate who has had shadydealings on a board. C4C is a joke. Dey already walking around George Town with bodyguards visiting people in GT and dey not even elected yet. "the C4C was the most popular team in this election"
Just a bunch of people hoping to play a role the morning after election. Hope they dont get one call. Polls do NOT work! Romney was ahead on some polls in the USA too, see where that got him…..C$C I beg you, please stop trying to fool the Cayman people. You are a party of people. Give us some solutions and stop bashing the PPM. You are advertising that you are not for bashing other politians and YOU C$C are always bashing the PPM. The PPM are clearly a party, a very good party of non corrupted Politicians, so why are you so against them? They will give the solutions when the campaigning starts and "Yes" they will work those solutions if they gets in, history has proven that…will you, will you work your solutions? Give us YOUR solutions too please? tell us the truth are you Party or not? are you part of the UDP? Where were most of your candidateds for the past 10 years…where were you? what have you done for Cayman? Were you active in the communities? or were you so busy making money and not sharing with your neighbour? Tell us the TRUTH!!! The truth is that the definition of a party in the Elections Law is a "group of people running together". Joey is already singing like a canary on his Facebook page. I added him as a friend just so I can laugh at his rants! That man's light bulb is very dim….he is losing it I tell ya! So you are going to believe Joey with all he has been accused of at the Turtle Farm and ERA??? Really??? Good luck voting and may the good lord bless us, people please respect yourselves and each other! And anyone who votes for a candiate that was a staunch UDP member, praised UDP up and down, then all of a sudden they left UDP…I don't want someone like that running my country….a worm with no backbone goes which way they wind blows..and I hope and pray all you people realize that!!!! Oh you forgot to mention "vote for the one who want to reduce the Politicians salarys by half. Thats quite enough for 4 meetings per year. Who ever is conscious minded enough to announce that I will support that candidate. I support a party, so when they called me I just gave them a bunch of fake answers so I could hear all of their questions. If other people did as I did, Roy and the rest of them better not use that as a measuring stick. You support a party so you need your head examined. Please google party politics in the Caribbean and see for yourself that it has been the downfall of our neighboring islands. Until our people stop swallowing the party poison, we will only sink deeper. We are a tiny country of only 60,000 people, we do not need party politics. We need a few good administrators that will stop favortism, get better teachers, better accounting and stop the waste and debt. Guess what? our income is enough to run the island, only wastefulness and greed of both the UDP & PPM has put us into debt. We need good people, not parties. Every time C4C has 12 thumbs up or down depending on the comment. Shock and surprization is in store for those C4C candidates. Mark my word. When they called me I informed them that all 6 of my votes would be going to Dr. Frank, and then I hung up the phone. I agree 09:13, when they called me, I told the person doing the survey, that I was voting for Craig Brown and the person then rudely hung up the phone, so I feel that if you are only listening to the few people that say they will support C4C(ash), obviously the polls will favor them! Seems they brought their UDP ways with them into C4C(ash)! C4C is so green (stupid) that if you put um out in grass piece,even cow would eat um! UDP green following C4C into their new party. Alden is very worried now. McKeeva is laughing that he is not the only one. And C4C is feeling very confident. Should be an interesting election. Why should Alden be worried? Clearly C4C has some sorting out to do. Why doesn’t ppm release details of its poll and the popularity of its leader? C4C is the 3rd party for sure now. They showed their hand now by running a poll to test the strength of their candidates. Beware C4C candidates you are going to owe these money guys lots of favors. With only two C4C candidates endorsed they paid a US company to do all this research? For their sake I sure hope the 49% that said they would vote for Winston and Roy were all in GeorgeTown or they won't even get those two elected. Was this research to see if they should endorse Jude and the others that have been waiting for endorsement for weeks now? Joining C4C is not proof of independence. Most of them are former UDP supporters. But its proof that they are willing to be controlled by the merchant/professional class elite who are funding their campaigns and will expect a return on their investment once they are elected. Truly independent thinkers should/would stay well away from C4C. Alden does not control the PPM. Yep that’s the formula right there, they are all working together, both incumbent PARTIES know that their time has come and we have given them notice to vacate, however the "deals" that UDP & PPM have made with the devil must prevail, therefore UDP & PPM have strategized their plan (C4C) to complete their parties( UDP & PPM) share of their "shady dirty deals" which both parties are involved with, they are so indebted with very unsavory businessmen here in Cayman they have no choice but to find a way to complete their deals therefore up comes Cayman's first "independent party" (damn jackasses who they really think they fooling). How are you independent and you’re not alone? Cayman please make your voices heard this election, the 2013 General Elections will be the only chance we the people have to change what is happening in our country. Take a good long hard look at all of these individuals remember them and their ethics, choose very wisely, send a clear cut message that what we have been dealt from our government officials during the past 12years (PPM-UDP-PPM-UDP) will no longer be tolerated, this is coming from someone who voted for both parties so therefore I have seen both of these parties for who they really are and that is only for themselves. PPM sat by as the Opposition and allowed UDP to destroy this country as did UDP when they were they Opposition. UDP Mary Lawrence- was given the position of the Speaker of the House; to shut her up. Kurt, successful businessman, yet ran the country into deep debt with excessive and ill advised spending on various capital projects. Alden, is a lawyer by profession-Why did he not stop the sale and purchase of the WB road Crown/Caymanians land? Yet persons without professional knowledge of Laws and Torts could take this Issue before the courts to have an injunction placed on this Dart project? $$$$$. Osborne, runs his mother’s gas station!!! Lucille, spends most of her time down in Swamp GT. Mckeeva, Gardener/Real Estate Broker-has no formal secondary or college education, selling Cayman off to the highest bidder, given full control for Portfolio of FINANCE, TOURISM, & DEVELOPMENT. Where were these so very concerned C4C candidates when all the Tyranny was happening, why did they sit by and allow this to happen, why did they not step forward as concerned, educated, professionals to inform their fellow country man of what could be done by the country/the people to stop this, if they are not in this election for money, then they had nothing to lose by offering up then what they are proposing to now do if and when elected. Jackie, former Customs Officer at HM Customs?? Lawyer!! & is also the sister- in- law to Author and Infamous Inmate S. Brown…. Rohan, dad is UDP(chip off the old block), and face book has pics with him and UDP Mckeeva embracing each other at Mckeevas 2013 birthday bash at Richard Parchments’ House in West Bay. Ask yourself what have both parties accomplished that has brought our country forward, ask yourself the same questions regarding the C4C and the so called independents candidates what have they actually contributed to their country and communities. Discuss what you know about their INTEGRITY, what kind of leadership skills do they possess, who they are affiliated with, what about their backgrounds, any criminal histories? WHO WILL BRING CAYMAN BACK TO IT'S GLORY? C4C, I think you have some really good ideas and some very promising candidates. But you really need to go about things differently. I saw a lot of negative comments on Facebook and on CNS about these polls because they took people by surprise and the surveyors wouldn't say who paid them to conduct the survey. Polling is very new to Cayman, and with a small electorate and very vindictive politicians and supporters it's understandable that people are wary of a phone call out of the blue asking that individual who he or she supports this election. You should have announced your intentions to do this poll BEFORE the phone calls started. You also should have been more clear about what C4C is all about, how it is different from a party and what you hope to achieve before you had any rallys. Yes, people are fed up with political parties. But it's because the UDP are a one-man show and that one man is a disaster, and the PPM are ineffective. I truly believe the hearts of the PPM members are in the right place; they did a lot of good while they were in office and are exceedingly honest but they are also slow to react and don't communicate well with the people. Don't make the same mistakes. By saying you are not a party you are being criticised from both sides – those who say you are a party and are being honest, and those who say you are not a party and therefore can't form a government. It is also strange that some of your co-founders declared weeks ago but are not yet officially "endorsed". One would think you would have a press release ready to go as soon as that happened instead of leaving these long periods where everyone knows the candidate will be endorsed but it is not forthcoming. I will probably be voting for most of your candidates in my district because I think they would be good representatives. I also look forward to seeing the final slate of candidates and truly wish you well. But I also really, really wish you had gone about things differently because a lot of people will not vote for your candidates because they don't trust you. And you've got an uphill battle to May trying to convince those people that they should. How would the PPM have achieved more in a house controlled by a UDP majority? In case you missed it, jumping up and down and screaming condemnation at McKeeva was no use. Organising protests marches and town square rebuke had limited success. Demanding that McKeeva step down in the interests of the country and the protection of his office after the first investigation didnt work. Neither did it work after the second and third investigation or the fourth and fifth for that matter!. Same for the first and second motions of no confidence. Who brought the final Motion of No Confidence that succeeded? Dont confuse deliberate and thoughtful action with in-effectiveness. Remember the party song, "VOTE STRAIGHT, VOTE STRAIGHT, VOTE STRAIGHT" … and look where it got us! I think people are waking up and taking a serious look into individual candidates. Kiss bye bye to the UDP / PPM song "VOTE STRAIGHT"!